The Piccolino is made from 201 stainless steel powder coated. It has a thin layer of refractory insulation blanket. The dome is a double walled steel with insulation. The ilFornino® Piccolino flooring is made from 1” thick medium density firebrick seamed for a clean flat surface. Heats up between 20-25 minutes and retains the temperature at about 700 °F. On average you can cook a pizza in less than 2 minutes. 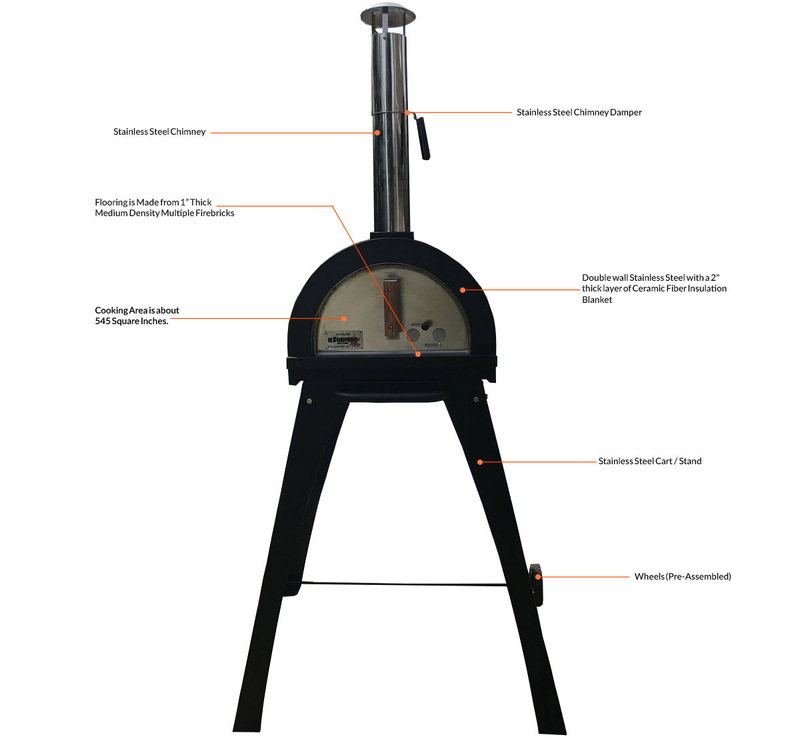 ilFornino® Piccolino Wood Fired Pizza Oven is ready to be placed on the included steel cart / stand with casters for easy maneuverability. You may choose to put it on a island if desired. It includes the User / Assembly Manual. Oven outside dimensions: 33.5" L x 21.5” W x 15" (to the base of the Chimney). Height of chimney stack is 25" H x 4" in Diameter. Door Opening dimensions: 15” W x 8” H.
Height assembled from floor to top of chimney: 80"
Oven net weight without stand: 150 lbs. The Cart/ Stand does not come assembled. User will have to assemble the Cart/ Stand. Assembly time is less than 30 minutes. The oven is fully assembled except for the Chimney. A video on how to assemble your oven will be available in the video section. The quality of the oven is amazing. It bakes great pizza & pies. Solid package, easy to transport. I love this pizza oven. I am very happy with the oven. It is very easy to assemble and it’s well built. The quality of the oven is perfect. I really enjoy using this oven. Highly Recommended. I bought this for a 4th of July party. Once it arrived and I opened it I could tell by the way it was boxed up by manufacturer it was legit. Really quality built for the price. I fired the oven & threw in a pizza and spun it around 2 times over the course of 90 seconds or so and it was done. Everybody said it was amazing including myself! The kids enjoyed the pizza making process as well! I would definitely recommend this product. Awesome pizza oven. Great quality construction. I recommend it to all pizza lovers!